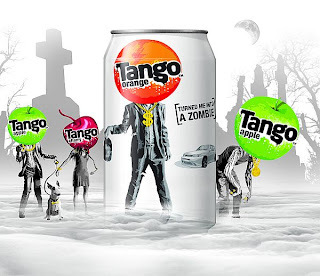 Tango; the makers of fizzy drinks has launched a new promotion to coincide with Halloween. The promotion features cans of Orange, Apple, and Cherry Tango with fruit headed zombies in various poses on the cans. The promotion features the slogan 'Tango turned me into a zombie'. I have my fantastic friend, and her housemate to thank for informing me about this promotion. I don't think I would have known about this if not for them. The cans are kinda cool, though seems Tango has jumped on the bandwagon of zombies being cool to promote their drink. I am a fan of Apple Tango, and Cherry Tango, just never been a fan of the Orange variety!